Did you know that WCS is a leading expert in EARTHQUAKE RETROFIT in Oregon and Washington? Do you live in a house built prior to 1940? If so, unless your house has been previously retrofitted it is not structurally connected to your foundation. Our team has been specially trained for earthquake retrofitting with Simpson Strong-Tie, a leading manufacturer of the highest quality metal connectors, anchors, fasteners and shearwalls. These products are designed to meet or exceed all code requirements. At Western Construction Systems, we perform structural retrofit, which attaches the structure to the foundation, reducing the ability for movement during a seismic event. Our system ensures that your home is firmly attached to your foundation, and we then provide you with a certificate of completion which can be used to obtain earthquake insurance. Schedule your complimentary site inspection to learn how affordable earthquake retrofitting really is. To learn more about what you need to do to retrofit your home for earthquakes, visit Simpson Strong-Tie or download their Step-by-Step Guide. The integrity of your foundation is our specialty. Guaranteed. 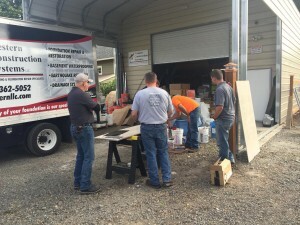 Since 1987 Western Construction Systems has been a local Northwest based specialty contractor. One of our specialties is earthquake retrofit. 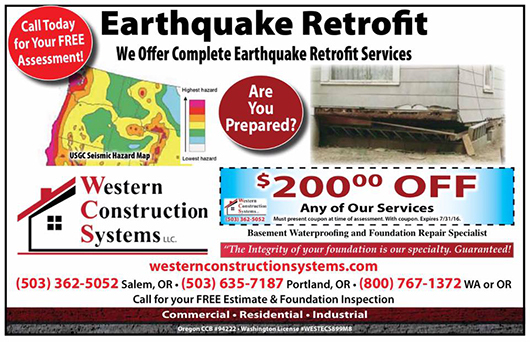 Western Construction Systems offers complete residential seismic upgrade and foundation strengthening services. Beyond the general bolting of homes to their foundations we aIso offer additional foundation strengthening. Almost all of the homes that we retrofit (older than 1940’s) have unreinforced foundations (no steel or rebar). These foundations were designed to carry the vertical load of the structure but offer very little lateral or seismic resistance. So, “That’s great we bolted our home to the foundation. But, what happens if the foundation just crumbles? !” We are asked this question often. We are experts at providing cost effective options to reinforce these old foundations. 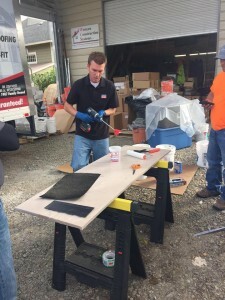 The most common method we use is carbon fiber reinforcing. The primary benefit of carbon fiber systems versus traditional retrofit and repair methods is that significant flexural, IateraI, axial or shear strength gains can be achieved with an easy-to-apply composite that does not add significant weight or mass to the structure. Many of the foundations for which we use this technology to repair are 100+ years old and have no internal reinforcing. Using these systems, we can significantly strengthen and provide the lateral reinforcing necessary to extend the life of the foundation and resist IateraI forces and seismic activity. We offer free estimates and free inspections. Our trained and highly knowledgeable project managers will assess your situation and design the most appropriate upgrade for you. We don’t just do the minimum.